With this image I was going for a more sensitive, and perhaps dignified portrayal. I’m kinda’ fond of the outlandish, tragic, or ridiculous versions of myself, or wanted to get some of them out there before the inevitable knee-jerk accusations of terminal narcissism surfaced. I do think a lot about which portrait to make next, and how it reflects on the prior ones. I wanted this portrait to stand on its own, even if you knew nothing about who it is. Most people flicking through Instagram have no idea whatsoever. I wanted her to have presence, and that means that she should also seem present. 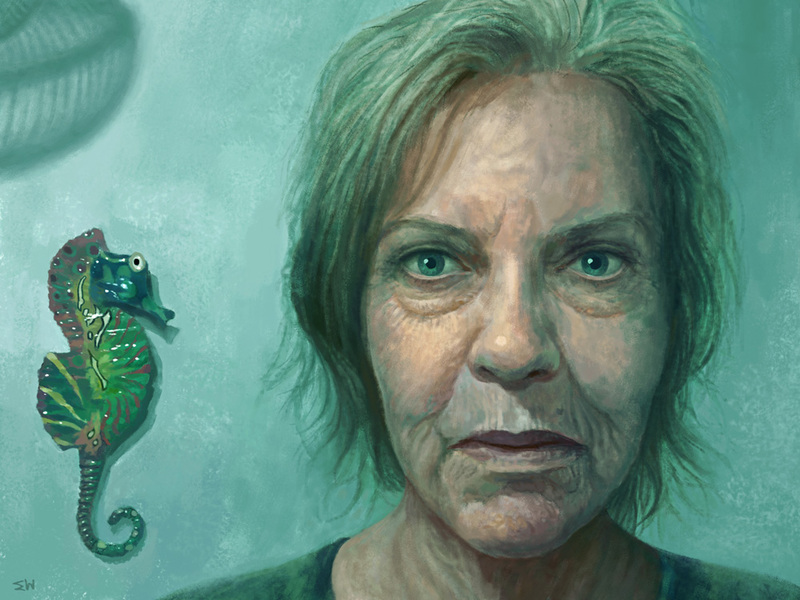 If you follow her eyes it’s as if she’s looking at the sea horse (who, inanimate, is more permanent than she is), but because it’s behind her she’d have to be looking in a mirror. If you are looking at her looking at a sea horse in the mirror, that puts you in her place (little subconscious trick there). I suppose that’s in a lot of the images, that it is (at least a vicarious) self-examination for the viewer. As with all the images a key element is that I hope to bring life to someone who doesn’t even exist. This was the spark of my original motivation. 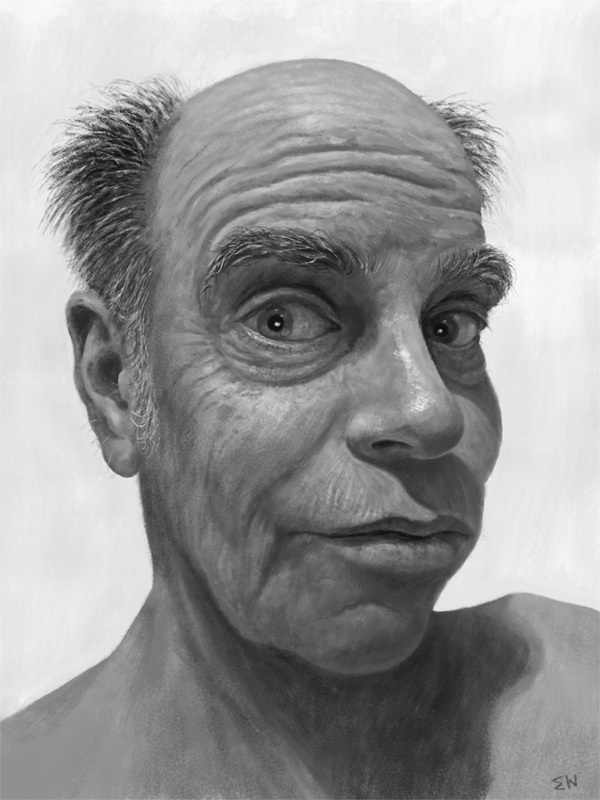 The app created new people, some of whom I found had an uncanny realness to them, and I lamented that they didn’t exist and would perish if I didn’t memorialize them in much larger and realized digital paintings. This one kind of reminds me of something Andrew Wyeth might have done (much more skilfully, and in watercolor). SFAU #26, by Eric Wayne. Digital drawing, 18×24″ @300 dpi. 8/11/018. I just blocked in the general form, moving from the general to the particular. I’d already moved the sea horse and made other compositional changes in PS. Here it is a little later. In the final image you’ll notice I added more hair to the lower left of her head, and I started to shift the palette more aqua. This may have had something to do with the sea horse, but really I was just doing what felt right according to the mood I wanted to convey. Below, I’m working on the eyes by comparing the original photo of mine, the version the neural network made (after feeding the image through a couple times), and making a composite in the middle. Yeah, I was getting frustrated with the eyes because there was something wrong and it was not easy to pinpoint and fix. The neural network distorts the crap out of images sometimes, and one can’t trust its wicked artificial intelligence. I tried several techniques before being satisfied. I’m still not thrilled with the eyes, but they work overall. And in this image I was less after the precise details than the whole effect. I mostly worked zoomed out, which for the analogue people is akin to working at arm’s length. I used one pastel brush for this. Nothing special, folks. Standard PS brush. It’s my favorite PS brush, perhaps because I did some oil pastel drawings/paintings in the past. The individual strokes are more apparent in the details. With the hair, above, you can see how I tried to suggest it without getting too technical. Here’s the whole image again. Best to click it in order to see it alone in a new tab, and sized for your screen. You might start to notice things like how the sea horses tail mirrors curls in her hair opposite it, or other subtle manipulations that only become apparent if you stop and savor an image. Posted in Selfies From Alternate UniversesTagged art, contemporary art, digital art, digital painting, drawing, painting, portraitBookmark the permalink. I really like her! This is your second “kind old lady” and … I don’t know, there’s something very pleasant, inviting and heartwarming about them. It makes me want to chat with her/them. And this lady, in particular, appears like she has a lot of insight and spiritual depth. You nailed the dignified look! The seahorse is badass too – it looks 3D. Thanks. I’m glad it came off as intended. Many, many personages to come.